Kolfage issued a signed statement in federal court in 2015 that he regretted any consequences that came from posting Janet Vrotsos’ personal information on his Facebook page, but now pretends he doesn’t know who she is. Kolfage claims, without evidence, that his new nonprofit organization can build a wall on the southern border for half the cost of the federal government. The founder of the viral $20 million border wall GoFundMe campaign exposed the personal information of a retired woman suffering from breast cancer in 2013 after he falsely accused her of operating a satire Facebook page that had authored a meme making fun of him and his family. Janet Vrotsos unwittingly inserted herself into an internet feud between triple-amputee veteran Brian Kolfage and a satire Facebook page called Republican Family Values (RFV), which had previously published a meme mocking Kolfage, who has since begun fundraising to build a wall on the U.S.-Mexico border. Determined to find the person responsible for the meme, Kolfage concocted a trap to expose the administrator of RFV. 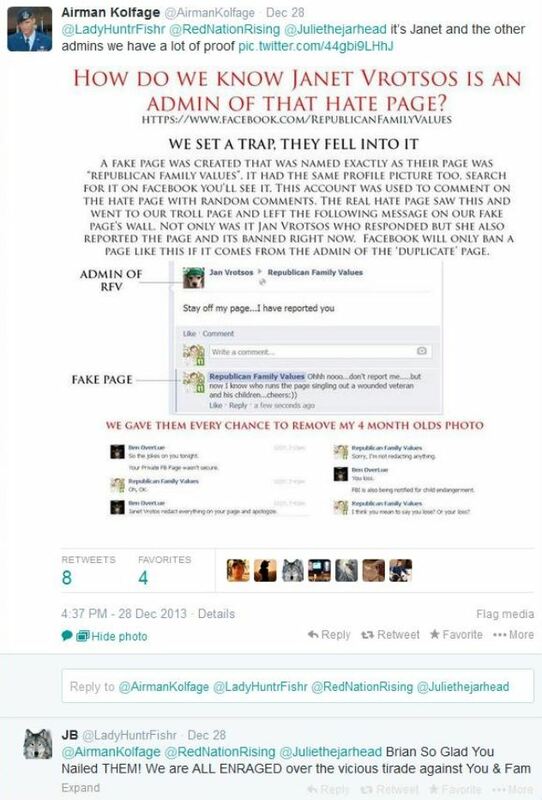 Kolfage created another Facebook page and formatted it identically to RFV, according to screenshots of a now-deleted social media post where Kolfage explained the scheme. The “fake” RFV page then posted incendiary messages to the real RFV page in an effort to suss out the identity of its administrator. “It’s Janet … we have a lot of proof,” Kolfage tweeted from his now-suspended Twitter handle @AirmanKolfage. The reply from Twitter user @LadyHuntrFishr is still viewable. 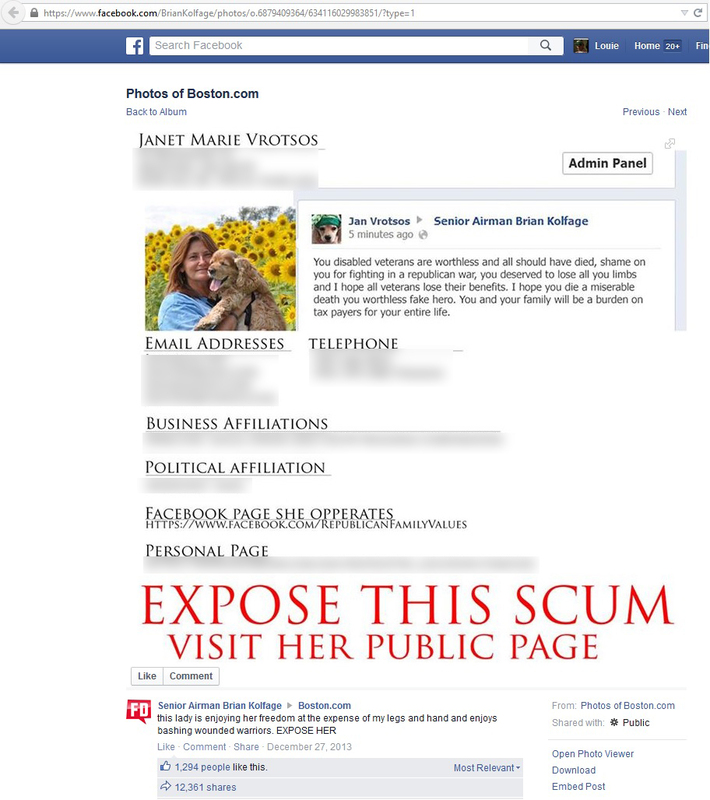 @AirmanKolfage I do not know Janet Vrotsos at all. That is 100% true. She does not know me either. She is not associated with RFV. Kolfage used the statement to call on his followers to “expose” Vrotsos in a post containing her home address, emails and telephone numbers. Vrotsos, the now-66-year-old daughter of a World War II veteran, adamantly denies she authored the post. She initially thought her account had been hacked. TheDCNF reviewed correspondence between Vrotsos and a computer forensics firm that determined the Facebook post Kolfage said she wrote did not come from her computer. Vrotsos filed reports with the FBI’s Internet Crime Complaint Center and Massachusetts police departments, she said in a follow-up statement from the union in January 2014. “It was awful. It was a nightmare,” said a longtime friend of Vrotsos, who wished to stay anonymous due to fear of retaliation from Kolfage. Liberal blogger Thomas Clay Jr. came to Vrotsos’s defense after Kolfage doxxed her and has remained friends with her. “I didn’t know Jan from Adam, but I knew from a psychological profiling standpoint there is no way she wrote what Brian said she did,” Clay told TheDCNF. But the harassment and death threats continued. Vrotsos said she is still receiving harassing messages five years later. 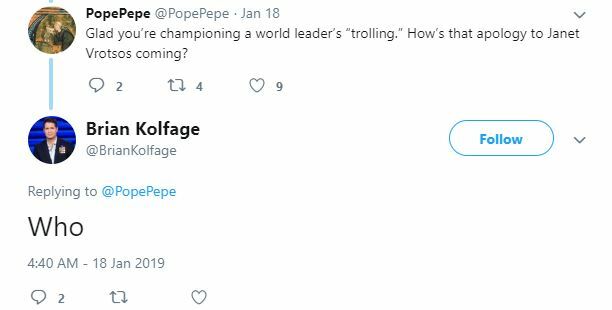 In fact, Kolfage now claims he doesn’t know who Vrotsos is. Vrotsos chuckled when asked for her reaction to Kolfage’s newfound amnesia. But Clay was incensed. U.S. District Judge Russel Holland on May 29, 2015, ordered Koflage to sign a written statement admitting that he published her information on his Facebook page and that he regrets anything that was done to her as a result. “I published Jan’s information on my public Facebook page and I regret anything that transpired to Jan as a result of that,” Kolfage wrote in a signed statement submitted to the U.S. District Court of Arizona on June 30, 2015. Kolfage was ordered to sign the statement as part of a settlement agreement between him and seven individuals he sued in July 2014 for allegedly bullying and committing libel against him on social media. “Of the seven people he sued, four of us were vets. Of those four, three of us outranked him,” said Air Force veteran Darren Remington, who became a target after he criticized Kolfage for posting hyper-political content on Facebook while Kolfage had a profile picture of him in his military uniform. In the lawsuit, Kolfage accused Remington and the other defendants of making false and inflammatory statements about Kolfage, saying they called him a fraud, a racist, an adulterer and a plagiarizer. The case was dismissed with prejudice nearly a year later in favor of the defendants, meaning Kolfage can’t sue them again over the same incident. The only concession the defendants wanted from Kolfage was an apology to Vrotsos. Kolfage also sued Marine veteran Justine Grant. 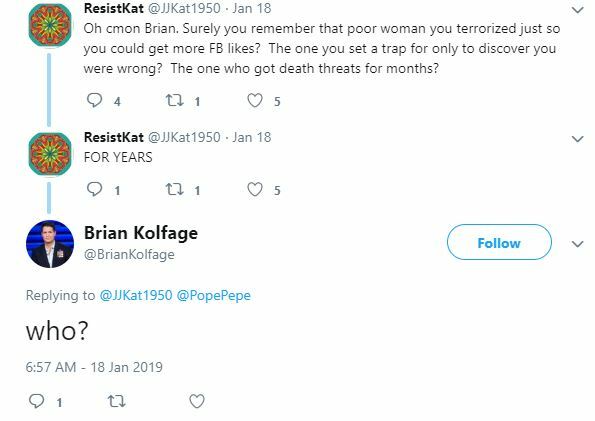 She told TheDCNF she first started following Kolfage after he doxxed Vrotsos. Kolfage’s responded by playing the victim and threatening to sue, according to Grant. Navy veteran Louis Caponecchia said he was dumbfounded when he learned through media reports that he was being sued. Like Grant, Kolfage targeted Caponecchia after he stood up for Vrotsos. Caponecchia said he’s convinced that someone within Kolfage’s circle photoshopped the Facebook post insulting veterans that Kolfage used to justify his decision to expose Vrotsos’ personal information. Caponecchia has never met Vrotsos in person, but said he felt compelled to get Kolfage to apologize to her because he knew the damage Kolfage inflicted on her reputation would last. And while Kolfage did admit wrongdoing in federal court, Caponecchia is trying to mitigate the damage Kolfage inflicted on Vrotsos’s reputation. Kolfage did not respond to multiple requests for comment.